Special guest teacher, Vinnie Sensei, is back again! Welcome back, Vinnie! Today he will be teaching us how to use the passive form in Japanese. Hello again, I am Vinnie. 元気でしたか？= Genki deshitaka? = How have you been? Maggie Sensei made a causative verb, させる ( = saseru ) & させられる( = saserareru) lesson a long time ago. Today we are going to learn the passive form. Now I’m here because Maggie sensei invited me to teach here again. = Maggie sensei ga watashi wo yobimashita. = Maggie Sensei invited me. Let make it to a passive form. = Watashi wa Maggie Sensei ni yobaremashita. = I was invited by Maggie Sensei. We often omit the subject. = Maggie sensei ni yobaremashita. = I am bitten by a dog. = I was bitten by a dog. Note: I added the subject 私（ = watashi) to make it clear but again we usually skip the subject. = Maggie sensei ga kare wo hometa. = Maggie sensei praised him. = Kare wa Maggie Sensei ni homerareta. = He was praised by Maggie Sensei. Be careful! Technically any verb can be conjugated into passive form but sometimes it is not natural. = Miruku wa vinii ni yotte nomareta. = Viniie wa miruku wo nonda. = Miruku wo Vinnie ni nomareta. = I got my milk drunk by Vinnie. In this case the subject is a speaker. Let’s look at some more example sentences. = Kono ryouri wa Touhoku chihou de taberaremasu. = This dish is eaten in the Tohoku area. The subject is “this dish”. You don’t have to say who eats the dish. We can tell from the sentence the hidden subject is people in Tohoku area. = Kono zasshi wa ooku no hito ni koudoku sarete imasu. = This magazine is read by many people. = Kotoshi no natsu wa mousho ni naru to iwarete imasu. = It is said that it is going to be very hot this summer. = Sonna koto iwarenakute mo wakatteiru. = I don’t have to be told such a thing. I am aware of it. = Supeingo wa sekai nijukkakoku ijou de hanasarete iru kotoba desu. = Spanish is a language which is spoken over 20 countries in the world. = Nihon de ichiban nomarete iru biiru wa dokono biiru desu ka? = What is the most popular beer in Japan? = Nisen nijuu nen no orinpikku wa toukyou de kaisai saremasu. = The 2020 Olympic games will be held in Tokyo. = Sagurada famiria wa kenchikuka gaudii ni yotte sekkei saremashita. = Sagrada Familia was designed by an architect, Gaudi. = “Gerunika” wa Pikaso ni yotte senkyuhyaku sanjuu nana nen ni egakareta. =“Guernica” was painted by Picasso. ★Sometimes you can’t tell who did/does the action. = The wall which was just painted. = A dog called Maggie Sensei. = Watashitachi wa kirei ni souji sareta heya de shinnen wo mukaeta. = Kare no kutsu wa pikapika ni migakarete ita. = His shoes were polished bright and shiny. = Motto aisareru hito ni naritai. = I want to be a more lovable person. = I am easily to be deceived. = Yukari ga Maggie wo nazeta. The person who performed the action (petting) is Yukari and I, Maggie, is the receiver of the action. = (Watashi wa) Yukari ni nazerareta. = I got petted by Yukari. = Sensei ni yobarete shokuin shitsu ni itta. = I was called by a teacher and went to the teachers room. = Maggie wa neko ni ijimeraremashita. = Maggie was bullied by a cat. = Haha ni tanomareta node kaimono ni ikimasu. = Since I was asked by my mother, I will go shopping now. = Gomi wo getsuyoubi ni dashitara, kinjo no hito ni chuui wo sareta. = I put the trash out on Monday and was cautioned by a neighbor. = Joushi no ie ni shoutai sareta. = I was invited to my boss’ house. = Iwareta toori ni yareba iindesu. = Just do what you are told. = I was removed from the follow list. *Note : リムる ( = rimuru) is a Twitter slang word and it means to remove someone from one’s follow list. Passive form to show your annoyance or disappointment. When someone’s action affects you in a negative way or it causes you some trouble, you use passive form. = Maggie ga watashi no oyatsu wo tabeta. This sentence doesn’t involve any feelings. It is just a statement that Maggie ate my snack. = Maggie ni oyatsu wo taberareta. The subject of this sentence is “I” but what was eaten by Maggie was my snack. This sentence doesn’t involve any feelings. It is just a statement of the fact that it rained. = I got rained on. = Maggie wa watashi no ashi wo funda. = Maggie stepped on my foot. = I got my foot stepped on by Maggie. = Kare wa Maggie ni ashi wo fumareta. = He got his foot stepped on by Maggie. = Maggie stepped on his foot. A lot of time, if you translate this type of Japanese sentence into English using the same subject and a person who causes the problem, they may not sound natural. *Subject is/has been/was done something by someone. It may be more natural to reverse the order. Someone did/does/has done something to you. Ex.Maggie stepped on my foot. So I will translate the following sentences in the most natural way. = Zutto hoshikatta doresu wo hoka no hito ni kawarete shimatta. = Someone bought a dress that I had wanted to buy for a long time. = Osanai koro, chichi ni shinarete haha to tohou ni kureta. = When I was a little child, I lost my dad and my mom and I were devastated. = Kare wa tsuma ni sakidatareta. = His wife died and left him alone. = Konna osoi jikan ni korarete mo komarimasu. = It’s inconvenient for me if you visit me this late. = Tomodachi no ie ni asobini ittara, sanbyakumai mono ryokou no shashin wo miserareta. = Keijiban ni waruguchi wo kakareta. = I got badmouthed on the bulletin board. = Someone badmouthed me on the bulletin board. = Fukeiki de kaiko sareta. = Oi ni kamera wo kowasareta. = Thank you, Vinnie Sensei! = Kono ressun ga ooku no hito ni yomareru to iine. = I hope this lesson is read by many people. = I hope many people read this lesson. Could you be my Patron? Passive form means something is being done to the speaker but I also read in your lesson that it can also indicate negative (or happy?) feelings (I never knew!! 😖 )? I will borrow one of your examples : 上司の家に招待された。= I was invited to my boss’ house. If you heard that hoe would you know if the person was happy about it, unhappy about it or just saying they were invited to their boss’ house? 1) neutral: just telling the fact that the speaker was invited to her/hi boss’ house. You can tell by the context or tone of his/her voice. Sorry for the super late reply but just wanted to say thanks! And Happy New Year for you too!! Maggie sensei, thank you for your reply. I raised this question because I was reading about られる. It says there are four usages, 受身形, 可能形, 尊敬語 and 自発. Initially, I thought all verbs in 受身形 can also mean 自発. But according to your explanation, it seems that is not the case. Besides 考えられる and 思われる, are there other 自発形 verbs that have the same pattern as 受身形? Is 言われる considered 自発? I also always encounter the three verbs above in ている form. What is the difference between 考えられる・思われる・言われる and 考えられている・思われている・言われている? In passive, using your example, 私は彼に変な人だと思われた, there is someone, 彼, who does the thinking. In 自発, 今年の冬は厳しいと思われる, who thought that this year is cold? Me or everyone in general? How do you determine whether a verb like 思われる in a sentence is 自発形 or 受身形? = I was told by A that I am fat. = People said (It is said) that Japanese people don’t show much emotion. The speaker was thought to be a strange person by him. people in general think this winter will be harsh. Q:How do you determine whether a verb like 思われる in a sentence is 自発形 or 受身形? Hello Maggie-sensei, could you please explain how 受身形 is used to mean 自発? You use it when you describe something objectively. When you get the feelings/something happens “naturally” without any control. = I was thought to be a strange person by him. You don’t do anything but you hear/understand/see things naturally without any control. Hi Maggie sensei, thank you very much for the lessons!! May I ask you a question? So far, my understanding is that, using the passive form, sometimes imply negative feeling (e.g. 甥にカメラを壊された。), and sometimes not (e.g. 上司の家に招待された。). My question is, when someone uses passive form in a blurred situation, how do we know whether he/she has bad feeling? For example, if someone says “本を友達に借られました。”(my booked was borrowed by a friend.). How do i know whether she has bad feeling lending a book to a friend? She might not like it, but doesn’t know how to reject. Or, she might be very willing to do so. How do I know/guess? it shows annoyance. You wanted to borrow a book but someone else took it. Actually, you teach the rule for forming passive voice by changing the Verb to ない then add れ, is much much much easier to remember than the other rules. Too headache with this rule. I really respect all of you who are working hard learning Japanese. I’m just wondering about the difference between 受身＋たい VS ～てほしい. I agree. The second one sounds softer because it is focusing on yourself. Thank you for your help, Maggie. Just a small additional question. It is natural in 日本語 to use ～言われたい during a conversation towards your 話の相手（例えば「ご主人さまと言われたい！」とかと言いたい時に＾＾）? Because in English if I used “I want to be said” then this would sound ちっと変. Yes, I assume you use passive form in Japanese much more than English. And thank you for the 平気=>元気 correction! I’m a little confused about the particle を when using the passive form. Why is the particle used を and not は? Is it because the dress is something *I* wanted and not a random statement? And in this case X is something I own or something related to me, and someone is doing something to my X(foot, etc). However in some cases I read the X belongs to the person doing the passive statement, like a statement i read beforehand 「ユニフォームは手を突っ込まれやすい」in this case the hand belongs to the other party. Is there any way to understand it better? You use を as an object marker. The same rule works for the passive form. It is possible to use “は” when you show the contrast or emphasize the particular dress. Someone bought the particular dress that I wanted but other dresses are available/I bought other dresses. Let me change the example a little. to stick/thrust one’s hand into one’s pocket. So 手 is an object of one’s action, sticking/thrusting, so you use を. Thank you very much for your response! I now understand the explanation for the dress part, but I’m still unclear about the second part. I do understand the X は passive + やすい but I’m not sure about the を in the use of passive sentences, as in does the word before を belong to the subject or the person performing the action, or does it depend on the context? I’m sorry for disturbing you so much, and thank you for your explanation! I changed the example sentence a little. Please check my previous answer. 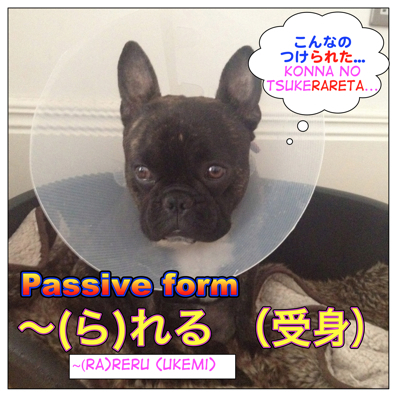 We never really covered passive or causative verb forms in Japanese at school, so causative is next on my to do list! Intransitive – the action happens, there isn’t a direct object (the door closes, ドアが閉まる). Any magic tips on learning all the intransitive verbs would be appreciated! Ukemi passive form at least has much easier rules on how to form it, but the use of it sounded a bit like intransitive verbs to me, and I’ve been struggling to see the difference in when you use each of them. Obviously my English grammar isn’t good enough :'( I think I’m getting there, though. intransitive ドアが閉まる could mean it happened by itself. intransitive 教わった would be more used if you learned something from TV or a book. One thing I have picked up is that English passive is made by a form of ‘to be’ and then the past tense of the verb. Anyway I had a couple of notes on your actual lesson, sensei! * One is, is よぶ = to call/to invite a ‘group 2’ verb, because it looks like it conjugates the same as ‘group 1’, but you have listed it as group 2? * The other is, is it necessary to change group 2 verbs to their negative form? Because it seems like you are adding ‘nai’ just to take it straight back off again. But I don’t know if you just said that because it’s easier to give the same rule for both groups of verbs. I think I released some mini list of transitive/ intransitive verbs or quiz on Twitter/ Facebook / Patreon but not here yet. But I have a lesson on 開く／開ける, etc. Your interpretation of all the example sentences in the comment is right. Using passive form sometimes involves the speaker’s feelings as well. 閉められた could be just describing how the door is closed or the speaker shows some emotions such as annoyance. Thanks for the notes. I will take a look at them when I have more time. Maggie Sensei, Konnichiwa, shitsumon ga arundesu ga ii desu ka. When someone fix your camera, you usually appreciate that person so you don’t use a passive causative form. As you say 直してもらう Someone fixes your camera for your favor. Now as for 2) is tricky. こんにちは、I have a question Maggie, when should I use を or が in a passive sentence? Can you be more specific? From what sentence? Hi Maggie-sensei, I have a question with regards to ukemi. I came across this sentence. 私は時々「水」の代わりに「冷や」という言葉を使いますが、頼んだ人は私が日本語を話していることに気づかず、水をもらえません。Why is 頼んだ and not 頼まれた? Is this due to viewpoint? I mean if I am at the scene, from my viewpoint, shouldn’t the writer who places order be 頼んだ人 and the waiter who takes order be 頼まれた人? Yes, the person who ordered water is 私 so you have to describe it from the speaker’s point of view and it is strange to to see the waiter’s point of view. = The person I ordered water. If from the speaker’s point of view, the waiter is 頼んだ人, then is there a 頼まれた人 from speaker’s point of view? You use 頼まれた人 for the third person. If you use 私 as a subject, it will be strange to say （私に）頼まれた人 in that sentence. I think I got it. I try to summarize below. Customer ordered water to waiter. From customer point of view, waiter is 頼んだ人. From waiter point of view, customer is 頼まれた人. It depends on the particle. Could you please explain? Thanks! に is either an indirect object marker or “by”. In this case an indirect marker. Many thanks, Maggie Sensei! I understand it now. Can we use kara instead of ni as below? The sentence itself is a bit unnatural but you can use “kara” instead of “ni. I took an order from a customer. お客さんに注文を受けた。= Okyakusan ni chuumon wo uketa. お客さんから注文を受けた。 = Okyakusan kara chuumon wo uketa. Kouike sensei americano gakkai n ikareru younara watashi mo tsurete itte moraemasen ka? Can you explain why its passive? That is an honorific expression. The passive form and honorific form such as ~reru, rareru are the same so you have to interpret by the context. Put wakarenai cuz i wouldnt be able too understand fukanou desu. I guess thats wrong though? kyou wa saigo no kurasu kara, watashitachi ni shashin o torarete kurete, mina wa kitekudasai. What do you want to say in English? It’s our last class so we are going to take a picture together? Then you don’t need to use a passive form. Kyou wa saigo no kurasu nanode, minna de shashin wo issho ni torimasu. (or torimashou) Zehi kite kudasai. （私は）赤ちゃんに泣かれた the baby cried (and let me nervous) / I got cried by the baby. If you translated them in English, they don’t sound natural but I think you got the idea. 雨に振られた= I got rained on. 赤ちゃんに泣かれた= The baby cried and that makes me nervous/ I was/am in a trouble. Hi Maggie sensei I’ve just started studying for the N3 test using the So-matome books and already hit a roadblock on the first grammar point. I hope you can help. So I think understand the basics of the られる form, but what the textbook is trying to teaching me is confusing me. The explanation they use for the られる form says “When you mention a fact without a subject, the passive form is often used” 「主語を表さないで事実を述べるとき、よく受身形を使う」. Here are a few examples. There is no detailed explanation in this book. The entrance ceremony will take place in this hall. This is said to be the biggest diamond in the world. The idea used to be considered correct. Is this a different grammar point using られる or am i just not fully understanding the the られる form? in this case it’s just like in English. The passive form is very often used when the focus is on the action. It is not important or not known, however, who or what is performing the action. Also a statement in passive – as you already know – sounds more polite and formal. I am really confused about particles. 1. Is there any difference in unsing “に” and “によって”? Is it so because bad (or in some cases good) feelings are connected with that situation? For example like here: 私は先生に作文をほめられてうれしかったです and 大切な洋服を弟に汚されてしまいました　(additionally emphasized by しまう?). And also like here, when someone is negatively affected by an action: となりの人にたばこを吸われて、気分が悪くなりました. Is it the same to use は instead of が or are there any particular situation where we cannot change it? = America was discovered by Columbus. 2. As for the particle, here are the basic patterns of the passive form. 4. When some misfortune thing happens you use a passive form to show you are a sort of victim of the incident. Hi Kai, Thank you for your comment. I am very happy to hear our site is helping your study! You really reply to everyone ! We’re so lucky to have you. You’re welcome! And I am very to have you all. Thank you for your lessons. You really should consider to make a series of books to learn Japanese. Congratulations! Just one question: do you have any lesson using “shimau” (at the end of the sentences) ? I don’t have a lesson on しまう but please check ちゃう・ちゃった lesson. It is a casual form of しまう. I explained some of the usages of しまう there. First, the passive form for 学生は学校に通う is not natural. Many students go to this school. →This school is attended by many students. However, I have been struggling with this which has made me a bit discouraged about still learning Japanese beacause I have found no one who could answer my question. My problem is particle に in the passive voice. に is used to express the agent in the passive voice, the origin of the action, the performer, right?, however, this contrasts with its directional meaning (to/towards/for) and this, let’s call it, contradiction in meaning makes understanding particle に very difficult for me in the passive voice. Why is a particle that indicates direction or target such as に used to indicate the origin of an action (the agent) in the passive voice? It makes no sense in my head because the performer (agent) is not supposed to be the target of the action but the one that performs the action, the origin. I don’t know if I have exposed my problem clearly, but I hope you can help me solve this puzzle. My advice for you is not to stick to one function of に.
Japanese particles have many functions. Ex. 本を買いに* でかける= Hon wo kai ni* dekakeru. = to go out to buy a book. Ex. 11時に寝る。= Juuichiji ni neru = to go to bed at 11:00. Ex. １日に３回、薬を飲む= Ichinichi ni sankai kusuri wo nomu. = to take a medicine three times a day. This is what you use to make a passive and causative form. = Otouto ga watashi no oyatsu wo totta. = My younger brother took my snack. My snack was taken by my younger brother. =Watashi wa otouto ni oyatsu wo torareta. Can you please explain us, for this example, the difference between the ukemi form and the てもらう form. Here is the thing. When you are talking to the boss or someone related to the boss and talk about when your boss invited you to his house, you have to use the honorific expression. *Talking about the time when your boss invited you to someone superior or related to the boss. However, if you are simply talking about factual thing, you don’t need to use polite form. The way you explained it was very intuitive and logical. It makes sense now Only managed to read half of the lesson right now but will finish this for sure. Ohh transitive verbs and intransitive verbs are difficult, huh? But hope you enjoy learning Japanese in your intensive course. You are always welcome to practice Japanese in this comment sections. I will check your sentences. Thank you in advance for offering to help! I will definitely take up on your offer and be more active in the comments section. それでは、 いい週末を! こんばんは、マギー先生! Thank you for this lesson, it was very useful! ありがとうございます!! I would like to ask a question. A Japanese boy asked that—-> ハンガリーの方……日本在住ですか? It’s not clear for me, I’m a beginner. T_T and I don’t know how should I answer. Could you please help me? Thank you for your help in advance. はい、そうです。(=Hai soudesu) Yes, I am. いいえ、ちがいます。(=Iie chigaimasu.) No I am not. = Iie, Ruumania jin desu. = No, I am Romanian. = Hai, nihon ni sunde imasu. = Iie, ~~~ ni sunde imasu. BTW the sentence A is strange…. I think some non-native person wrote it. From my translation, A is loving B and don’t want to lose B, but he seems to be reckless person. is that correct? Yes, that sentence sounds like someone tried to translate it with Google translation or something. Hello! Thanks for this lesson, it’s very helpful. I only have one question to make about this, more like a confirmation. Sometimes I get confused about which verb form I should use, so let me see if I understand it now. For verbs of the same group as 食べる, I will use the masu form and add the られる? and for verbs from the other group, like 聞く, I will use the nai form and add れる? Also, thank you for linking to the lesson about saseru and saserareru, I have a lot of trouble with that too, hahaha. I added more conjugation information in the lesson to make it more clear. Please check. = Osanai koro, chichi ni shinarete [haha to] tohou ni kureta. = When I was a little child, my mom and I were devastated. Fixed it! Thank you for your help!! I really appreciate it!! Oh, I completely understand it now, no doubts at all! Thanks a lot! I replied in the wrong comment! hahaha, my last reply was meant to the information you added in the lesson. What is the difference between 造 and 作? The paradise (which is) made with perfect calculation. で here is a location marker.